September, back-to-school-month. Children and adolescents are hearing that freedom was good for them but that routine is better. Dark humour of the system! 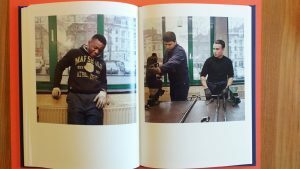 For the occasion, I am presenting here a photobook about the routines and the very complex reality in a vocational secondary school in the heart of Brussels: the Institut des Arts et Métiers de la Ville de Bruxelles. 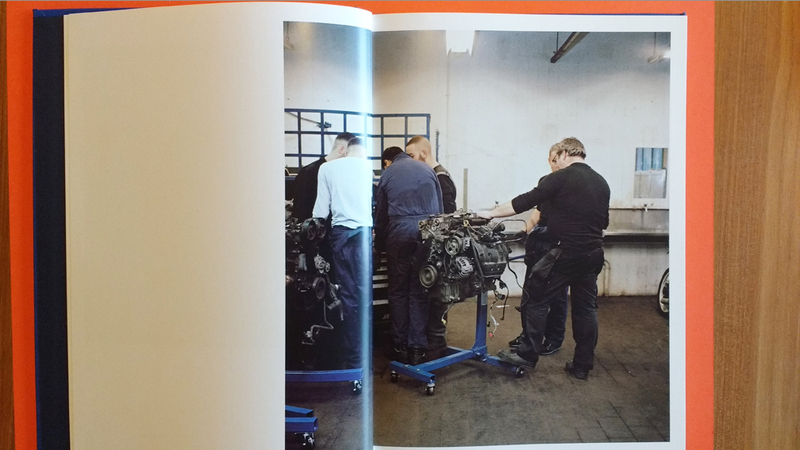 More specifically, the book is focussing on the students of its (automobile) mechanics class: la classe A008. Typically for Brussels, most of the students happen to have their roots in another country, even in another continent. Their minds and souls are molded in Tirana, Casablanca, Cali, Ouagadougou, Grozny…… Perhaps they are more citizens of the world, than citizens of Brussels. But in spite of their international backgrounds, their school is not really perceived as a cosmopolitan place. It is perceived as a difficult place. Most of the students don’t go there by choice. 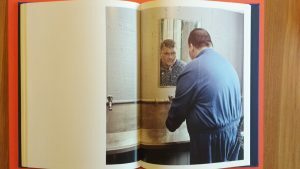 “They are told to go there by some teacher, career adviser, staff assessment“, as Andrea Rea points out in the book’s afterword. 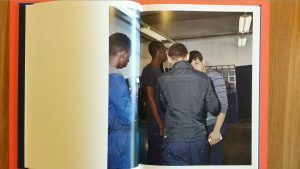 He also explains that the very nature of the culturally diverse communities in a vocational school is largely the consequence of an eductional system confirming pre-existing social inequalities. It makes that there is some kind of fatality about these boys’ enrollment at the school. Isabelle Detournay stated that she had the memorable film “Le Fils” by the Dardenne brothers in the back of her mind, when she developed the idea of working in the institute. But, the school gates did not open straight away for her. It was “with the audacity of the timid that sometimes can move mountains” that she had to convice an entire hierarchy of officials and of course also the students and their teachers themselves to enter their micro-cosmos. In 2013, she started to follow their daily routines and activities for a period of four years. 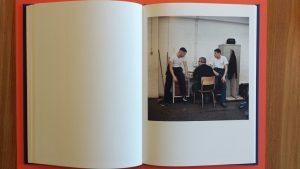 So, the result is this great photobook in which the disgraceful context of violence, suspicion and rejection in which the boys are often placed is ditched for good. It is Isabelle’s personal, cinematographic approach that changes our perception into one of respect, esteem and comprehension. Cinematographic? 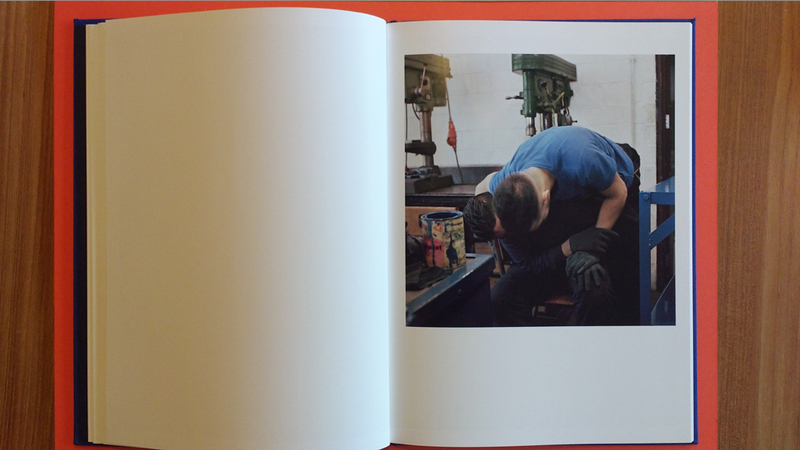 The photographer sees spanners, hammers, lathes as props. She sees the blue overalls and safety shoes as costumes. The neon-lit workshop is treated as a setting. The actors? Just boys together. On their faces Isabelle shows the concentration, pleasure and pride of learning; the exhaustion at the end of a gloomy winter’s day; the joy of being together; the tensions of being together too close for too much of time. The action? She knows how to catch the moments that turn a miserable day into a great one. There is the well observed posture of the teacher while he is speaking about the mysteries of an engine. His hand is gently lying on the thing. 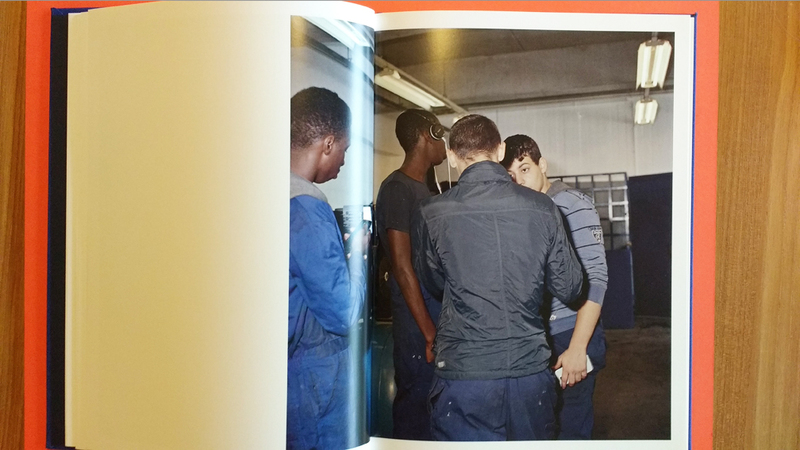 In another photograph, the same teacher is having a conversation with two pupils. He is sitting on a chair and his boys are looking down on him. He couldn’t care less about the inversion of the positions. He passes his knowledge to them and he has their respect. Isabelle has a remarkable eye for other details of the body language. Throughout the work, she shows hands that are cleaning, screwing, washing, changing socks, holding a machine, teasing, pointing ….How could one better underline the essence of their future “handyman” profession? 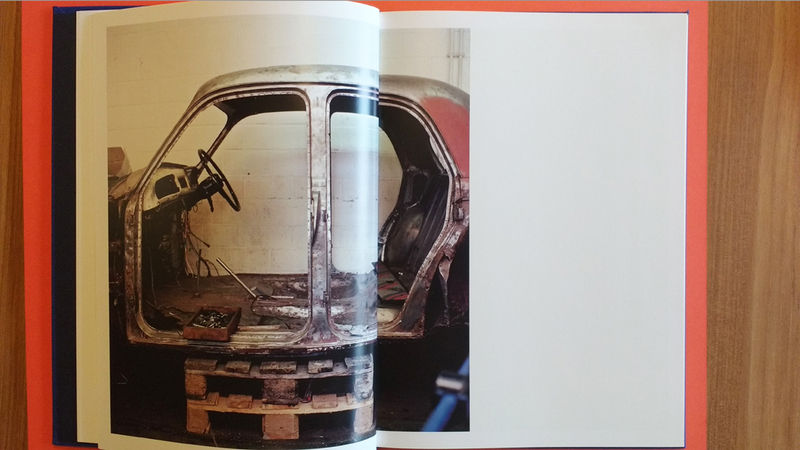 All the images are made in the interior of la classe A008. It creates the feeling that at least for the time being these young men are safe. This is especially the case, when we see glimpses of rainy grey Brussels through the windows of the class. Outside the window panes, that is where there is less time to learn; where it is more difficult to interact as one wished to interact; where there will be less camaraderie. A very demanding reality will be theirs, yes. But then, WHOSE REALITY COUNTS? 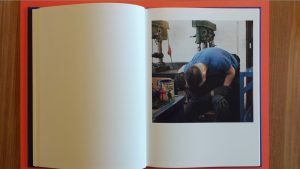 For me this question is one of the most important ones in the field of photography (and photobooks). 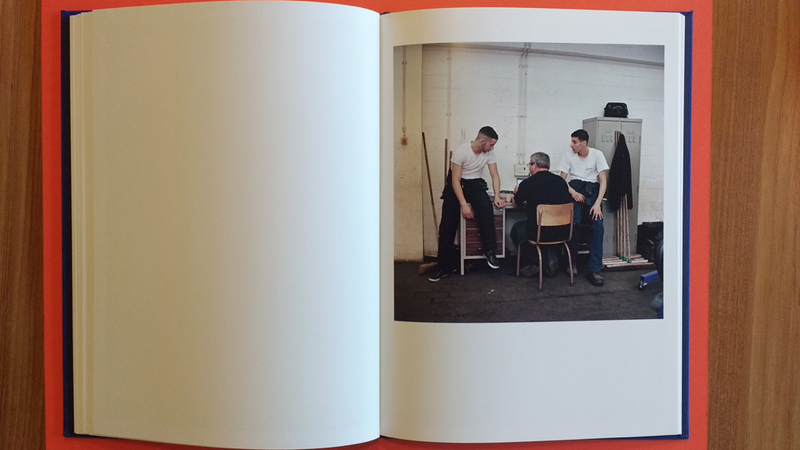 And Isabelle Detournay has a very strong track record of powerful photographic answers to it. “As it turns out, she has always involved herself in areas which have been stigmatized by society” says Adèle Santocono in another afterword. In 2005, she made a beautiful work on the majorettes on the countryside in Belgium. Afterwards she started working with folks in Brussels that have fallen behind. 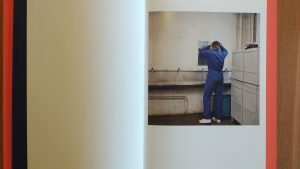 For example, she has projects in the Marolles and in the bars around the Gare du Midi (BTW these are the same places that have been treated by Pablo Casino and Pierre Peeters). However, her latest work on “la classe A008” is an uppercut answer to the question! The photobook opens and closes with an important prop. We see mirrors. Mirrors in which one can look with self-esteem. Waw! La Classe A008 may be a man’s world, but it would be nothing without this lady. Thank you very much Mrs. Detournay!